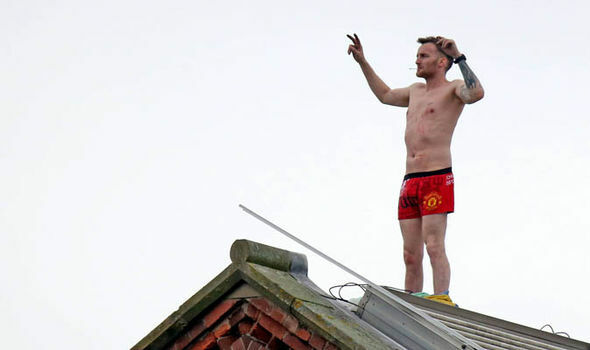 You might have seen that there was a three day rooftop protest at Strangeways (HMP Manchester) a couple of months ago. When most of the guys here found out about it, they were willing it to be just the beginning of a repeat of the Strangeways riots of the nineties. It wasn’t, but it did have a few consequences. Many people were transferred out of Strangeways when the protester took to the roof, including one friend of mine who has been moved between no less than five of the eight high security jails in England in the past couple of years alone. In fact, he has actually been at all eight over the course of his sentence and, following events at Strangeways, he is now back at Whitemoor prison. However, it was another prisoner who became my greatest source of entertainment for a day since he was originally here at Wakefield, he got transferred to Strangeways on a security initiated move, and then when the rooftop protest began he was brought straight back here. We were all shocked to see his return, but we were in utter hysterics when we heard the officers go to his door during lunchtime just two days after he arrived back here. They said he would have to pack his things again, which he objected to since he had only just unpacked them, and they said that he never should have been brought back here and that they were going to have to move him on again! This is a high security prison for God’s sake! So is Strangeways, come to that. How can it be that two of the nations most secure prisons cannot communicate and coordinate themselves, to such an extent in fact that they wind up putting prisoners in places they were never meant to be! I was talking with a member of staff about this and she said that one of her family members was working for the prison service during the original Strangeways riots and he had sight of certain documents between the prison service and the government. According to her, the riots could have been brought completely under control and ended within a day or two, but the prison service was told not to take any immediate action, and instead to wait it out, because the poll tax shenanigans were going on at the same time and the government wanted to refocus the media on events at Strangeways rather than have their disastrous policies thrown under the microscope. I don’t know how true that is, but it is certainly something that I can imagine Thatcher authorising, and it’s quite a good yarn too, so why question it? On this occasion the protest was not even allowed to get out of control in the first place, and the protester came down after three days. However, I can’t help but wonder what might have been allowed to happen if the protester had timed it better. Maybe if he had tried his luck during the government’s attempts to cut tax credits then he might have been allowed to stay up a little longer. The media might not have publicised the welfare changes so much, the public may not have been so aware of them, the House of Lords could have not seen such an objection in public opinion, and David Cameron might not have had his policy snatched out from underneath him. I guess that sometimes it doesn’t matter so much what you do, as when you choose to do it! Thank you for your blogs. I look forward to reading them. I am of the same opinion in that I too have discovered that the government tend to override decisions made by others, just to rush something through parliament. They put sensational stories out in the press to cover up their failures and to pass unpopular laws, in effect to hide things from the public. The public are becoming much wiser these days, they are realising they are being duped and controlled and certainly do not believe anything that is published in newspapers. The Nixon mentality (when the President does something illegal, it isn’t illegal) pervades the whole of Government in most countries, including Britain. The mainstream media are so close to the Government that I generally consider them part of it. “Slopping Out” officially ended in 1996. Has it ended properly now? No it hasn’t. Slopping out is still used in LongLartin. It is outrageous and obviously against human rights. I think it is also still in use at Swinden hall and in fact there was an outbreak of TB there last year. That’s sort of right. Half of LongLartin has in cell toilets but the other half (the vulnerable prisoners side) doesn’t. However, they no longer slop out as such, they can press a bell in their cell and (as long as no other prisoner is already out) they are let out onto the landing to go to the toilet. I was at Swinfen Hall from 2004-2009 and they have in cell toilets there too. The recent outbreak of TB is more likely to be a result of their shoddy healthcare provision. Have you read the judgment in Napier v The Scottish Ministers? I haven’t read that particular ruling but I understand it is quiet dated. I am aware that there have been rulings on both sides to say that slopping out either is or is not against human rights. I also believe that the Napier ruling was a case in Scotland so (since they have a separate prison and legal system up there) it is possible that the effect of the case was not transferable.